Am I eligible for a viatical? Health: Viatical settlements are for people who are terminally or chronically ill. Generally this means a person with a limited life expectancy. You will need your attending physician to write a letter verifying that you have a terminal or chronic condition. Policy Type: Universal, whole, and term life insurance policies are all candidates for a viatical settlement. The majority of the policies that get transacted are universal life. Policy Size: Policy size should be at least $50,000 in face value. Does a viatical settlement make sense? You can no longer afford your insurance premiums. A viatical is a great way to avoid letting your policy lapse if you can no longer afford the premiums which can often be the case with increasing medical bills. Letting your policy lapse can lead to little or no payout depending on the policy type. Your term policy is approaching it’s expiration date. Term policies typically expire with no cash value and expensive replacement costs. If your term policy expires in the near future it may make sense to convert it into permanent insurance and then engage in a settlement. You are looking to enjoy your last days. A viatical settlement allows you to supplement your income so that you can really enjoy the rest of your living days. Take on your bucket list. How is my payout determined? How much a life insurance policy is worth depends on several factors, and fortunately, viatical settlements often pay significantly more than traditional life settlements. When determining the value, a life settlement provider considers life expectancy of the insured, the type and size of the life insurance policy, and the expected premium costs. The provider will collect medical records through HIPPA release forms and perform a medical underwriting to obtain an accurate prediction of the policyholder’s life expectancy. To better understand what it will cost to keep the policy active while the insured is still alive the life settlement provider will look at the policyholder’s “in-force illustration” which is the technical way of saying, information from the insurance provider about what it will cost to keep the policy active moving forward. Again, the policy owner must have given the provider the right to obtain this information. Once the life settlement provider has an estimate of what it will cost to keep the policy active while the insured remains alive they can compare that cost with the policy’s benefit. At this point, providers use a mathematical model to help them figure out the amount they can pay the policyholder today and still achieve a sufficient return from purchasing the policy. If you are not equipped to handle the financial burden of terminal or chronic illness, there are numerous methods to pay for medical and long-term care costs. Borrowing from family and friends or taking on debt to pay for treatment are options to consider, but if it is ultimately in your best interest to use your life insurance policy for financial assistance, you must decide between selling your life insurance through a viatical settlement or requesting an accelerated death benefit (ADB) from the insurance provider. An accelerated death benefit is a policy rider that allows the insured to receive a certain percentage of the policy’s face value in advance of their death. 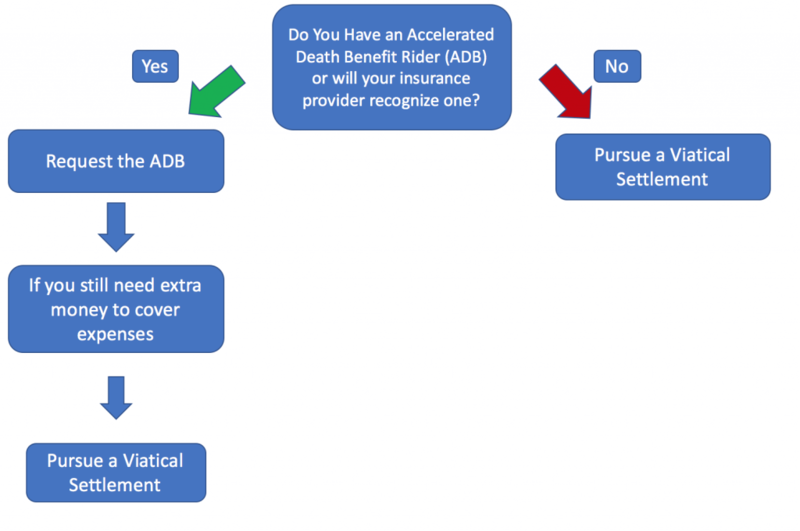 It is important to note that an accelerated death benefit is an optional rider, however, even if you did not originally purchase one, many insurance companies will still honor an accelerated death benefit. For most people, it makes sense to request the accelerated death benefit. Not only does it give you a significant amount of money quickly, you still retain the remainder of the death benefit not advanced. An accelerated death benefit advances anywhere from 25-95% of the policy’s face value, depending on the contract and the insured’s life expectancy. The policyholder then retains whatever portion of the original death benefit that is not advanced. When considering an accelerated death benefit, it is important to acknowledge the percent of the face value advanced is not equal to the amount of money you are paid by the life insurance company. The exact proportions vary with every insurance provider, but as a rule, the percentage of the policy advanced is greater than the percent actually paid to the policyholder. For example, let’s say Chris owns a policy with a face of $500,000. He files a claim to accelerate half of his death benefit ($250,000), and the insurance company decides to offer him $175,000 for this advancement. His policy’s face value decreased by $250,000, but he only received 70% of that amount. The insurance company uses a unique discount factor when awarding an accelerated death benefit. 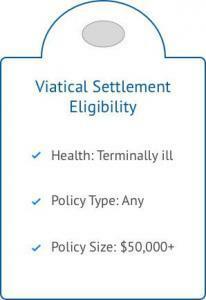 An underutilized option combines both an accelerated death benefit and a viatical settlement. The policyholder first files a claim for an accelerated death benefit. After the ADB process, the policyholder still controls a percentage of the original face value and can sell this to a viatical settlement provider. This combination allows the policyholder to receive the most money for their policy during their lifetime, but as with any viatical settlement, does not allow for the beneficiaries to collect any of the death benefit. An accelerated death benefit should be considered if the policyholder still wishes for their beneficiaries to collect a portion of the death benefit. Additionally, ADB payouts are generally greater than the payout from a viatical settlement transaction, but it is prudent to investigate both options. Regardless, a viatical settlement is a significant financial transaction, so proper research into all options is imperative. How are viatical settlements taxed? One of the major advantages of a viatical settlement over a standard life settlement is the tax treatment of the proceeds. While viatical settlement taxation is a complicated issue- tax codes on the federal level do not always coincide with state law and states do not always follow the guidelines set by the Internal Revenue Code- terminally and chronically ill policyholder’s often pay no taxes on the payout. At the federal level, most viatical settlement payouts are treated similar to a death benefit. This means the money you recieve is tax free, but first, you must ensure you meet all of the requirements in the Internal Revenue Code, the piece of legislation that lays the foundation for viatical settlement taxation. The first requirement is the policyholder must be a terminally ill individual with a life expectancy less than two years or have been diagnosed with a chronic condition. Company policyholders do not qualify for tax free viatical settlements. Second, the policyholder must sell the life insurance policy to a licensed life settlement provider in their state. If your state does not require providers to be licensed, you can ignore this clause. The provider must also be a regular purchaser of life insurance policies and abide by certain requirements agreed to in the Viatical Settlements Model Act. If you do not fall under these rules, your payout will be treated as regular income and taxed accordingly. And please keep in mind that Mason Finance does not provide tax, legal, or accounting advice. This material has been prepared for informational purposes only, and is not intended to provide, and should not be relied on for, tax, legal, or accounting advice. You should consult your own tax, legal, and accounting advisors before engaging in any transaction. How are viatical settlements regulated? Viatical settlements are regulated by each state through their respective departments of insurance. Today, 45 states and Puerto Rico have comprehensive viatical settlement laws and regulations. This means that more than 90% of the US population is protected by state regulations. It is worth noting that both Michigan and New Mexico regulate viatical settlements but not standard life settlements. Most regulated states closely follow the National Conference of Insurance Legislators (NCOIL) Life Settlement Model, the National Association of Insurance Commissioners (NAIC) Viatical Settlement Model, or some combination thereof. Importantly, the NAIC Viatical Settlement Model suggests minimum payouts depending on the life expectancy of the policyholder. One of the key things that viatical settlement regulation covers is how long a policy owner must have owned their policy before they are eligible to sell. 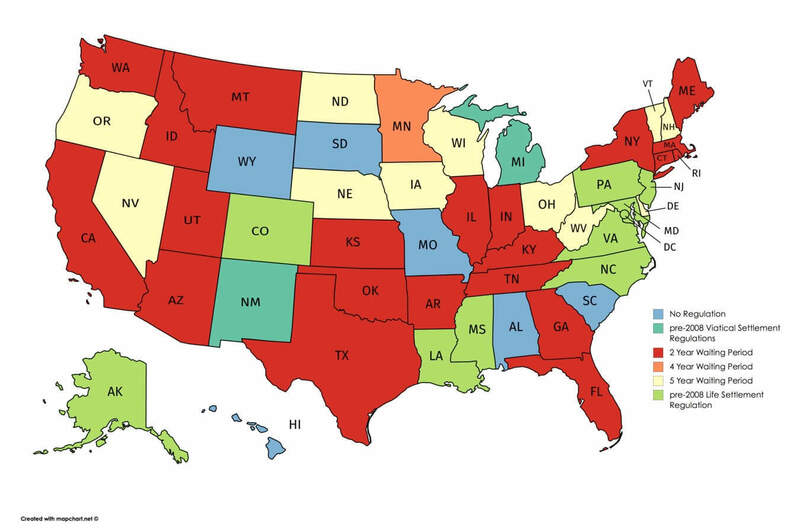 Most of the regulated states have a two year waiting period but if you want to know the specifics for your state you can check out this life and viatical settlement regulation map. Many states do have do have provisions that allow people to sell their policy before the end of the waiting period in the case of terminal illness. Another major part of viatical settlement regulation is transparency. States that have comprehensive regulation require that policy owners receive substantial disclosure- including the disclosure of compensation paid to brokers. In addition to disclosure of broker compensation, most states also require that policyholders receive all offers and counteroffers, information on the alternatives to a viatical settlement, and are told about the risk pertaining to taxation and government assistance programs. Another important thing that states with comprehensive regulation require is the licensing of both viatical settlement agents, brokers, and providers. Viatical comes from the latin word viaticum which means a supply of provisions or an official allowance of money for a journey. The name makes sense given that viatical settlements provide much needed cash to terminally ill policyholders. A viator is a policy owner who sells their life insurance policy death benefit to a third party. The legal basis for the secondary market sale of a life insurance policy was established in 1911 in a case, Grigsby v. Russell, that ultimately reached the United State’s Supreme Court. The case revolved around a life insurance policy taken out by John C. Burchard. In need of a surgical procedure, Burchard sold his policy to his physician, Grigsby, for $100. A year later Burchard passed away and Grigsby attempted to claim the death benefit. He was challenged by the executor of Burchard’s estate, Russell. This decision, handed down over a century ago, gave legal precedent for the mature and regulated life settlement industry that exists today. This precedent has been reinforced over the years, most recently with the Health Insurance Portability and Accountability Act (HIPAA) in 1996. The modern life settlement industry began to take form in the 1980s with the establishment of the first viatical settlement company. With the onset of the AIDS epidemic, many victims faced extremely short life expectancies. Many of those that owned life insurance policies found that they no longer needed the protection but needed cash to pay for experimental treatments. It was under these circumstances that the first “viatical” settlements were created. 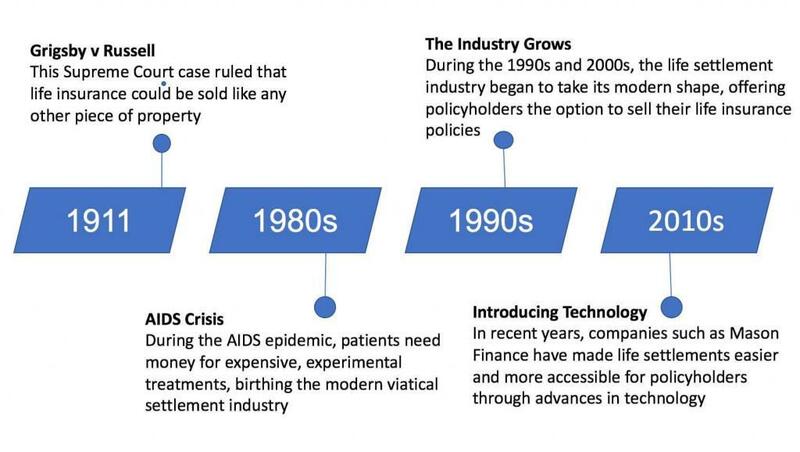 Ultimately, medical advancements made viatical settlements for AIDS patients far less common over time. But out of the 80’s was born the highly regulated and mature life and viatical settlement industry that exists today.